If you are a Graduate in any discipline AND/OR have some experience to your credit, You are eligible to fly high in your career and reach where you always wanted to be. 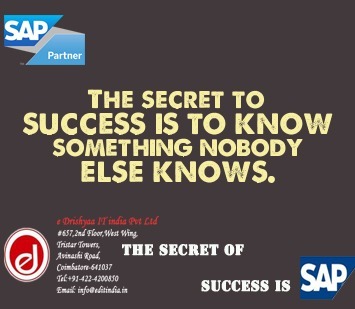 There are more than 2700 SAP Partners and 2,82,000 customers worldwide offering huge job opportunities in SAP. From IT Industries like IBM , TCS , Wipro , Accenture , Cognizant , Capgemini , HCL…………..toCore Industries like Pepsi , Coco cola , NestleTATA , Reliance,McDonalds, TVS , Ford , BMWand the list goes on…………………..
Work in Core Industries with High IT Packages…..
#657. 2nd Floor West Wing ,Trista Tower .